Furthermore, while it may seem tempting to purchase an essay from an online content mill or one of those websites promising to secure you a passing grade, this is not a good idea. More often than not, these types of ‘for purchase’ essays and reports are re-sold over and over again. And, most importantly, they are not your original work – meaning they ARE plagiarized. Throughout the lifetime of your scholastic career, it is likely that you will be told over and over again to take every measure possible to ensure that the work that you are submitting is yours, and only yours. This means not submitting someone else’s essay as your own, properly crediting any sources you might have quoted or used during your research and not using something that you wrote previously, in another context, without properly citing it. It sounds silly, but self plagiarism is a thing! Continue reading to learn what you can do to lessen the chances of intentional (and unintentional) plagiarism. Plagiarism is, literally speaking, the act of knowingly or unknowingly passing someone else’s work off as your own. Every educational institution in the World has an anti-plagiarism policy. Failing to adhere to this policy ultimately will result in a failing grade and maybe even expulsion. But, what does plagiarism mean? How do you check your paper for plagiarism? Is there such thing as an online plagiarism checker? Being found guilty of plagiarism, whether intentionally or unintentionally, has a lasting effect and might even impact a student’s ability to graduate with their chosen degree. The better post-secondary institutions seldom believe in second chances when it comes to students being accused of plagiarism. For a student, being found guilty of committing plagiarism follows them throughout their academic career, and possibly even further. Post-Secondary institutions share information, so even if an expelled student does attempt to transfer or register at a different school, the details of their indiscretion will be made available. Later in life, as a professional employee, attempting to plagiarize or take credit for someone else’s work will ultimately result in job loss and the ripple effect that follows. According to the definition given in the 1997 New Webster’s Encyclopedic Dictionary of the English Language, plagiarism is “the unauthorized use of the language and thoughts of another author and the representation of them as one’s own” (508). Plagiarism can easily result in a student failing their assignment, being expelled from their school or college or an employee losing their job. To incorporate another writer’s ideas into your work, you should use quoting, paraphrasing and summarizing. To avoid plagiarism, all students must document sources properly using Footnotes, Endnotes, or Parenthetical References, and must compose a Bibliography, References, or Works Cited page and place it at the end of the research paper to list the sources used. Of the three ways to document sources – Footnotes, Endnotes, and Parenthetical References, the simplest is using Parenthetical References, sometimes referred to as Parenthetical Documentation or Parenthetical Citations. Check to see which type of documentation is preferred by your teacher. Most word processors have the superscript, Footnote and Endnote capability. If you are required to use Footnotes or Endnotes, it is well worth the effort to master this feature on the computer a few days before your paper is due. If you use Parenthetical References you only need to put a short reference enclosed in parentheses immediately after the citation, then list the sources cited in your Bibliography, Works Cited or References page at the end of your paper. See Chapter 9 for Parenthetical References Examples as well as Parenthetical References Sample Page. If you use Footnote references, you must have numerically superscripted Footnote references at the foot of the same page where your citations are located, plus you must add a Bibliography, Works Cited, or References page at the end of your paper unless instructed otherwise by your teacher or instructor. See Chapter 7 How to Write Footnotes, Chapter 8 Examples of First Footnotes, and Footnotes – Sample Page. If you use Endnote references, your citation within the text of your paper is the same as your Footnote citation, but you must list your Endnote references at the end of your paper in superscripted numerical order on a separate page entitled Endnotes. You must still add a Bibliography, Works Cited or References page after your Endnotes page unless instructed otherwise by your teacher or instructor. See Chapter 7 How to Write Endnotes, Chapter 8 Examples of First Endnotes, and Endnotes – Sample Page. Do not be tempted to get someone else to write your research paper, hand in the same essay to two or more different teachers, or purchase instant essays from the Web. Taking a paper from your friend or from a senior student’s archive is also not a very good idea. Do not download information from CD-ROMs or someone else’s original work off the Internet and directly incorporate such information into your essay without paraphrasing and acknowledging its source. Remember that plagiarism also includes “ghost writing”, buying a text from someone and patchwriting — simply taking parts from various texts and combining them in your own text in different ways. To check your paper for originality before your teacher does it, use a plagiarism checker. Apart from you acting in an unethical, dishonest way, and learning nothing in the process, the problem is that your teacher probably knows you and your writing style too well for you to plagiarize successfully. Most secondary schools, colleges, and universities take a dim view at plagiarism which is becoming more rampant with prevalent use of the Internet. Technology has made it too easy for students to search and click for an essay and simply pay with a valid credit card for an instant download online. Consequences may be severe when students are caught plagiarizing, so it is safer to avoid it. What is more, detection services now exist such as MyDropBox.com, Glatt Plagiarism Services and Turnitin that are capable of catching culprits guilty of plagiarism. A free service to check for plagiarism can be found on Grammarly. A page entitled Works Cited, References, or Bibliography at the end of your paper is an absolute MUST for any serious research paper. What is a Works Cited page? A works cited page is a compilation of all of the sources cited in the body of the paper, as well as the material used during the research phase. This is also where the writer will expand the footnotes and endnotes and add any additional information regarding the authors of papers, publishers of blogs and other elements that will allow anyone reading the paper to quickly navigate to the original source should they ever require additional information or want to read the source referenced. 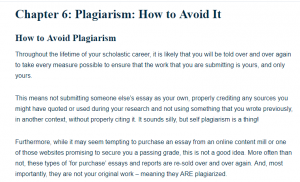 The most common example of plagiarism in today’s digitally connected world comes from hurried students purchasing essays and other reports off of online essay houses or content mills and passing them off as their own. More often than not, these acquired essays are not checked for uniqueness and may have even been recycled or sold to multiple buyers. Now a days, especially given the wide spread availability of technology, it is exceedingly hard to turn in a paper that is not your own and get away with it. You will be caught, each and every time. Moreover, even if you do not intentionally hand in someone else’s work, simply quoting someone or using a source without following proper citation styles is, in fact, plagiarism. Another example of plagiarism might come in the form of an employee attempting to take credit for the work create or report finished by their coworker or subordinate. Academic and Community Standards in Harvard College from Harvard College Freshman Dean’s Office, Faculty of Arts and Sciences, Harvard University, Cambridge, MA. Includes: Standards and Expectations in Academic Life: academic honesty, misuse of sources, distinguish what is truly yours in the work. Anti-Plagiarism Strategies for Research Papers by Professor Robert A. Harris, Vanguard University of Southern California. By now, you understand how easy it is to avoid plagiarizing someone else’s work. But, what if you don’t know that you are copying something said by someone else? How do you verify that you have properly cited your source material or block quotes? There are a number of free plagiarism checkers and paid resources online that you can use to verify the uniqueness of your paper. Each application will scan your text and conduct a plagiarism test that verifies the text against all available online sources to ensure that the work is either unique or properly cited. Plagiarism is easily avoidable, so long as you have done your due diligence in ensuring that you are only handing in work that is completely your own, and that you have taken the time to accurately cite any sources that you may have used or any quotes that might be included in your finished paper. In using the above-mentioned online resources, you will be able to quickly and thoroughly scan your paper for any unintentional plagiarism and, as an added bonus, many of these applications also check from proper grammar, spelling errors and other elements allowing you to hand in a finished paper that is guaranteed to get a grade that is equal to the amount of effort that went into creating it! Copyright and Fair Use from Stanford University Libraries. Contents: Copyright FAQs, Fair Use, The Public Domain, Introduction to the Permissions Process, Website Permissions, Academic and Educational Permissions, Releases, and Copyright Research. Copyright Issues on the Web 2. What Is Plagiarism? By Kristina Pfaff-Harris, University of Nevada, Reno, NV. EVE. Essay Verification Engine tracks down Internet sources of plagiarism. Free download for trial version. Focus on Ethics Can Curb Cheating, Colleges Find by Kenneth R. Weiss, Times Education Writer. The New Plagiarism: Seven Antidotes to Prevent Highway Robbery in an Electronic Age by Jamie McKenzie, Editor of From Now On – The Educational Technology Journal. Plagiarism and the Web by Bruce Leland, Western Illinois University, Macomb, IL. Plagiarism.com. Glatt Plagiarism Services. A tutorial software program designed to teach students about plagiarism, how to avoid it, and how to detect it in their writing. Plagiarism in Colleges in USA by Dr. Ronald B. Standler, Attorney in Massachusetts. Plagiarism viewed from a legal perspective. Cites plagiarism cases, and finds that in every plagiarism case involving a student or a professor the court upheld the punishment imposed by the college. Plagiarism.org. Promotes Turnitin.com a software that aims to put a stop to digital plagiarism. Provides information on Internet plagiarism and “cheatsites” online. Plagiarism Thread. Review by William Marsh of National University, San Diego. Topics include: Guarding Against / Avoiding Plagiarism; Assessment & Response; Cultural, Economic and/or Educational Backgrounds of Students; Pedagogical, Aesthetic and Ethical Values underlying Plagiarism; Copyright Violation & Plagiarism. Turnitin.com. Aims to put a stop to digital plagiarism. Originality Reports determine whether any homework assignment, essay, or research paper has been copied or paraphrased from the Internet. Understanding Plagiarism from Indiana University, Bloomington, IN. What Is Plagiarism at Indiana University? A short quiz with immediate feedback, and How to Recognize Plagiarism. What Can We Do to Curb Student Cheating? Article by Sharon Cromwell, Education World®. Here You can check your writings for Plagiarism for Free.